I've resumed work on the Black Powder mod and have some new assets to show off in-game. I'll use this thread to organize information about the mod and developments. For now here's a rough sketch of what exists so far. Two maps based on real world LIDAR and satellite imagery, modified with historic maps. One is a colonial Virginia city and its environs, 16 km x 16 km. The other began as a real island group in the Chesapeake but has evolved to become a tropical sea, nearly all water with clusters of islands, also 16 km x 16 km. (So far) 17 buildings authentic to the colonial period, some enterable. 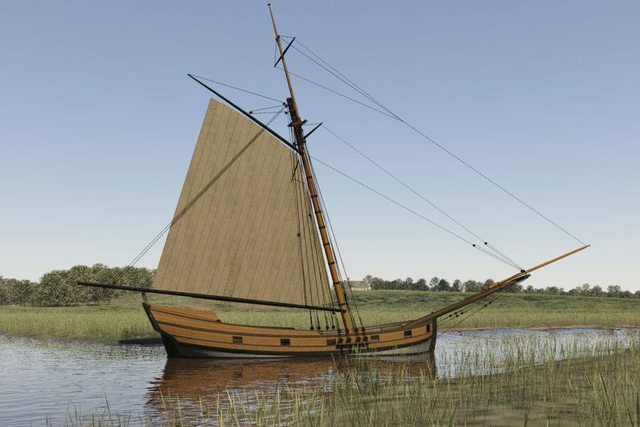 They sail on the wind and speed is affected by the direction of wind relative to vessel. All fire round shot and grape. Placeable chevaux de frises, gabions, fascines, and abatis. Common soldiers tents, subalterns' wall type, and officers' marquees. Also improvised shelter from tarpaulins or sails. The Wall tent and Wedge type also have versions that can be used as respawn points when players put them up. Are you working with the guy from the Napoleonic Wars mod? Wow, this looks amazing! Keep it up! Nothing better than the sound of drums on the battlefield. "His tricorn hat, his nankin breeches, his white cotton stockings, his shoes decorated with silver buckles, all announces that he is in the walking out dress of summer (petite tenue dâ€™Ã©tÃ©), and that he left his barracks to enjoy a moment of freedom under the terms of a permit which he will not misuse. I saw your first thread you created a few years ago, I'm excited to see you are resuming work. If you're working on this by yourself you might want to think about slowly releasing the mod and adding content as it is finished. Gives you something to be proud of and inspiration to keep working on the mod while also stirring up a following (hopefully). My personal opinion is that you should make this mod/game for Unity5 or Unreal 4 engine insted of Arma. For example how you going to use cavalry/horse or melee combat somthing arma do not support at all. * Maby add some trading rpg/survival aspect into this? How many working on this mod? Cool quote. I like the idea of releasing some parts of the mod early as I have been fighting bots, and every once in a while get an awesome game moment that would be fun to experience with a team. (might also help improve the game, as others can see the things I can't get to work right and maybe suggest solutions. Thanks, I'll have some screens of the new Brocard a la Suedoise 4 pound field cannon for you later this morning. (working on the LODs now, I just finished the model and base textures). Unreal's engine, support, and licencing are good. I started modding on that engine years ago (in fact started an early version of this mod in Unreal about ten years ago) and really like it -- also with them I could sell a full game for something like 5% of sales per month, very generous.) However, there are things about ARMA that I also really like and for now will try to add melee and horses etc here if I can get some assistance in figuring it out. I really like the idea of adding Indians. They were very important to both sides as well as having their own fascinating history during the war. In some ways they shaped the course of history as much or more than the other great powers and in game could really be a fun role. 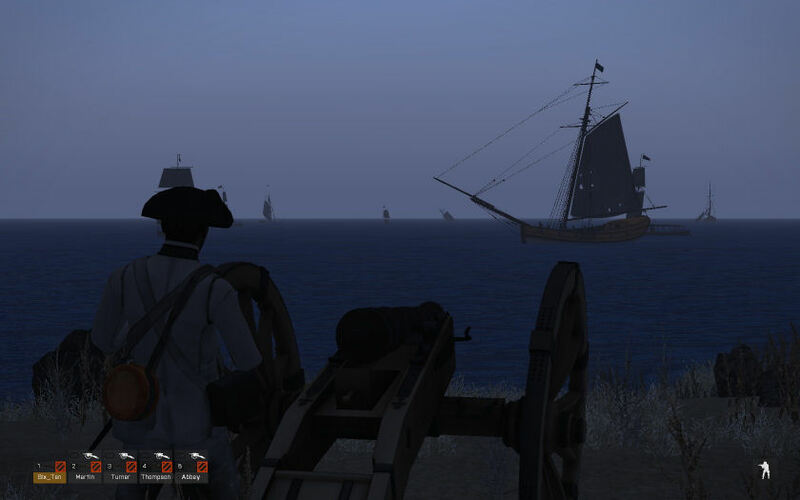 I want a trade system in part to drive the battle gameplay and provide opportunities for piracy (one of my favorite activities in Dayz). Sure they should also have muskets. My self I acctully have a similary idea like this one you working on now. My own idea is "Conquistadors 1492 " discover new land, with the new Arma 3 Jungle vegetation soon in our hands it could be intressting. Simple surviva game aspect,trade, simple weapons like spanish arquebus,crossbow,bow, basic melee weapons. Problem is that Arma would not handle this idea very well I think. Unity 5 & Unreal 4 would. But the biggst problem that really I want is working melee in Arma. For example our Hell in the pacific A3 mod need working melee for bayonet and katana sword attacks. But Arma where never made with Melee in mind so its a huge problem. I mean Arma is Arma, thatÂ´it. That's why i'm sticking to OFP and its built in melee ability. Horses are possible (look at my ofp mods), it's only a matter of animating a horse model and puting it in an empty/invisible vehicle as a cargo, the rider being the driver of the invisible vehicle. The horse is then animated by script according to vehicle speed. But animating the horse is a pain in the a** and i won't be involved in any A3 mod (too lazy). I have to look at your OFP mods-horses and melee?! This I have to see for myself! Just finished the LODs for the 4 pdr Brocard cannon a la Suedoise ("Swedish") and its limber. Until someone comes up with a horse you drive the limber like a car. Just found a video showing an articulated MTVR and trailer -- has anyone posted a how-to for the Physx setup for that kind of system? https://www.youtube.com/watch?v=Enj_aIkDgnQ It was elegant, exactly what this needs -- the simplest system as you can see the pintle on the limber holds the hole at the trail of the gun carriage. It will be a big improvement to be able to move the guns around. Here's a closeup showing the socket in the trail and the pintle on the limber. Now to find a way to connect them. Awesome! I'd love to see more old-school stuff like this. The whole "high-speed, low drag operator" thing gets stale after awhile. This looks like it'll be an interesting take on Arma. It'd be cool to see separate "lowered weapon" animations for the muskets. Having a new "double column" formation for AI would be really cool too. Can't wait to see more! Good luck! Both are shown in this picture. Instead of the normal animation for having weapons lowered, have the musket rested on the shoulder as shown. As for the formation thing, have two columns formed side by side. Not sure how feasible it'd be to implement any of this though. Probably more trouble than it's worth thb. I like that idea -- shouldering muskets is definitely going in. Great :) to be honest I would use that in the ordinary modern game as well when out on long patrols etc. I want to make the cannon fire by lighting the vent -- I'm modeling a linstock - basically a stick with a slowmatch wound around it and lit. If I put a memory point at the lit part of the match, and a memory point in my cannon barrel vent, can a script detect the proximity of the lit match and when it comes within say 0.5 m of the vent, it fires the cannon? Edit: anyone know if I can make the linstock a weapon and use FiredNear https://community.bistudio.com/wiki/Arma_3:_Event_Handlers to ignite the primer? Wow, your stuff looks very well done. I'm excited to see how it all functions in game. I'm playing around with a model of a ship I made and I'm very curious how you've created your ship and how it functions in game. As for your linstock I don't think there's a way to measure the distance between two point. What you might have to do is create an user action "Light Vent Hole" if the player is close enough to the cannon's vent hole and the player has a linstock. Once the action is selected it plays an animation of the player lighting the vent hole and then the cannon firing a split second later. The animation won't be aligned but it should look decent. You could even go through the hole firing procedure, swab cannon, load powder, ram powder, load shot, ram shot, run up gun if needed, prime vent hole and touch off vent hole. I want to reward teamwork -- a crew that is practiced and communicates well should be able to fire faster, safer and more accurately. Cannons typically had large crews. If you run solo you shouldn't be able to outshoot a team that has a man on the sponge, a loader, rammer, a guy to help aim, and one to fire. If that team doesn't communicate well and skips steps they run the risk of blowing themselves up. I'm deliberately leaving in things like the option to sponge the barrel after loading; if a crew is moving too fast they can ruin the powder, have to remove it and start over. 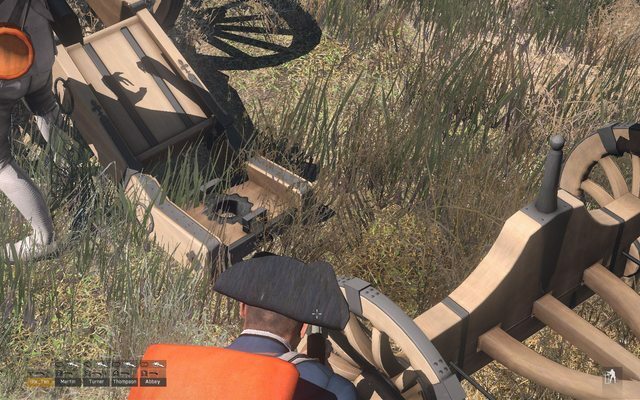 Player drives up to the battlefield with a limber towing a cannon. He dismounts (the limber looks authentic but since we have no horses it is basically the SamplesF\Test_Car_01) and walks back to the cannon. When selected the cannon is freed from the limber then that UserAction is hidden. Check that limber is near, if not, hint "The limber is too far away." If limber is near, attach cannon to it, then hide UserAction "Tow gun" then display UserAction "Unlimber the gun." When this is selected make tools, water, ammunition visible then hide this UserAction. Write arrays: gun is not loaded, not sponged, not primed. Hide UserAction "Prepare the gun position." Play animation: dip sponge into bucket, swab barrel with wet sponge, step back. Check if player has ammunition in inventory. If not then display hint: "Get ammunition." If so then proceed. Play animation: place charge in muzzle, ram down with ToolRammer, step back. 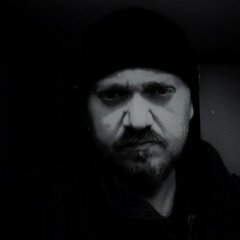 Check if UserAction "Sponge" has already occurred. If not then calculate random chance of gun firing during ramming. If it is bad luck, fire the gun and kill the loader, then clear the arrays: gun is not loaded, not sponged, not primed. Check if UserAction "Prime" has already occurred AND check if ToolLinstock is near vent. If both are true then calculate random chance of gun firing during ramming. If it is bad luck, fire the vent, fire the gun and kill the loader, then clear the arrays: gun is not loaded, not sponged, not primed. Write to an array that barrel is loaded. Display new UserAction "Unload the Piece." Write to an array that barrel is primed. Check if gun is loaded with good powder. If not loaded or if powder is ruined, then fire only the vent effects: zasleh fire vertical from vent and puff of smoke with it. Ignite zasleh fire vertical from vent and puff of smoke with it. Fire main charge and recoil. Clear arrays: gun is not loaded, not sponged, not primed. 4. UserAction "Unload the Piece"
Play animation, worm down barrel, step back. Add ammunition back into player inventory. Display hint: "Gun is now unloaded." Clear arrays: gun is not loaded, not primed. Hide UserAction "Unload the Piece." Deltahawk, what do you have working on your ship so far and what questions do you have? 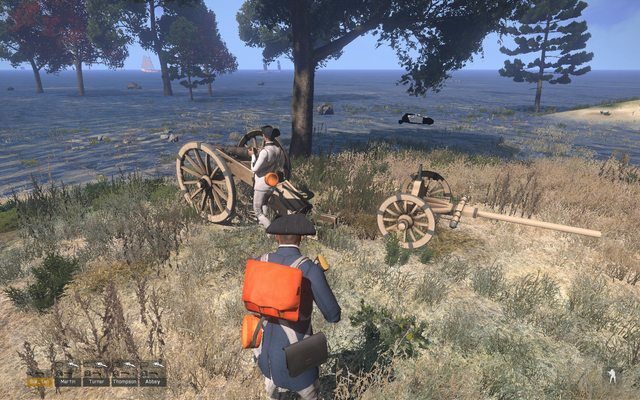 Found out a little while ago that I can't add the proper camber to my limber's wheels (french artillery from the 17th to the 20th centuries angle the wheels for stability). The cannon works okay, but its a static weapon. CarX only has one point for the wheel's axle so it cannot be angled. Needs two points. I suppose I can just not use the physx vehicle and use the old version instead. Its weird because I just copied the Test_Car_01 from Samples_F and it has two points for each wheel axis. Guess that's a legacy of the pre-sim days. Eureka! I think my spontoon works. I don't have an animation for it, but I managed to get a sharp stick to fire a bullet with duration of 0.004 and it has to be right on the guy before he yells out, then the second shot kills him. Going to try to make an animation for it now. Had a thought while running after and spearing a bunch of AI -- would this work? If bayonet is selected, is there a way to invisibly (to players) change the weapon from musket model with bayo to a spear weapon that looks like a musket? If he then scrolls and chooses "Use Firearm" then it changes back to the musket weapon. If he unfixes bayonet and puts it away, then the option is removed from the menu and he just has a regular firearm. maybe there's a simple way, like changing from firearm to grenade launcher or something. Firemode?